Faced with turning a workpiece from square material the only choice for most will be to use the four jaw chuck. If for a one off, or just a few then this may be acceptable but for larger quantities, especially with smaller sections, using the four jaw can be a chore. The idea for this project surfaced when faced with making around 100 2mm square nuts for a model cart. 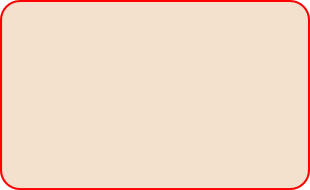 It is though worth considering for smaller quantities and larger section bar. Typically, if requiring to hold 6 mm square, then using a collet would be much better than using the four jaw. 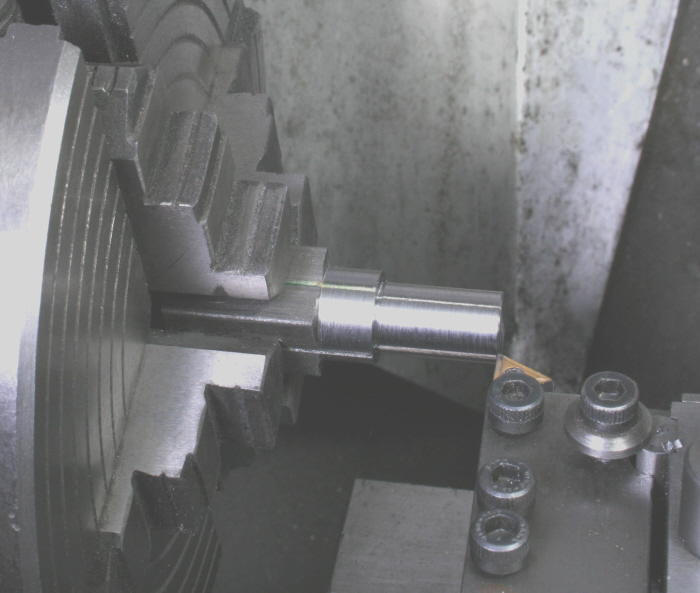 Unfortunately though, collets for holding square material are not available with some forms and expensive with others, and this article seeks to overcome the problems by adding auxiliary jaws to a round collet. 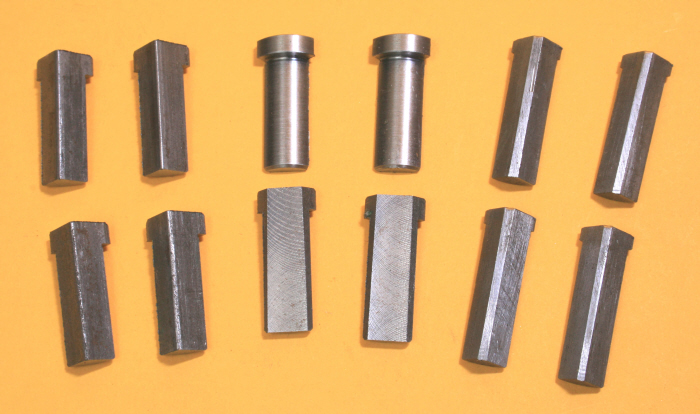 A set for holding 6mm square material in a 12mm collet is shown in Photograph 1, centre, together with a set of a smaller size (right) and a partially finished set(left) with Photograph 2 showing the 6mm set in use. Cut four pieces of square material and assemble with card packing as in Sk.1. 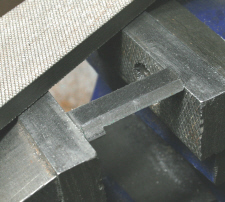 The size of material suggested enables a head to be made on the jaws preventing them from entering fully into the round collet when in use. 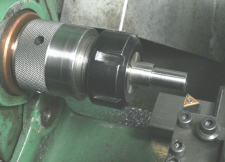 With the assembly mounted in the four jaw and projecting by the chosen jaw length, plus say 5 mm, the ends of the four pieces are faced level followed by machining the outer diameter to a minimum diameter of 2mm greater than the round collet in which they are to be used, and turning the required length to the collet diameter, Photograph 3. Remove from the four jaw and set up the collet chuck and return the jaws so as to turn the other end, Photograph 4, followed by parting off in the middle to produce two sets. 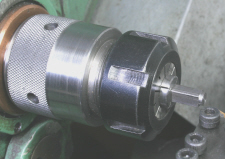 Whilst the one set is still in the collet face the end to produce the head. 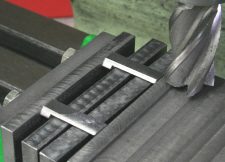 Next stage is to produce the required flats which can be done for small sizes by filing, Photograph 5, or for larger sizes by milling Photograph 6.